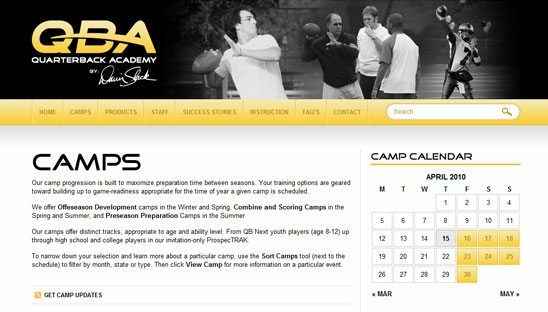 Quarterback Academy (QBA) is the leader in QB training and development. Our high school and youth quarterback camps, quarterback clinics and QB training have helped thousands of young football players reach their potential. Many have excelled in the NCAA and NFL. We did tons of custom advanced coding for this wordpress site. We used a plugin called “magic fields”, with this plugin it creates a whole new world to the back end so each section is easily maintainable to the client. Example would be the camps section, the back end has a editable area just for this section. We will be created a tutorial soon to show exactly what we are talking about. Other plugins on this site include event calendar, store locator and many more. Comment if you have any questions on how certain things were done in wordpress.